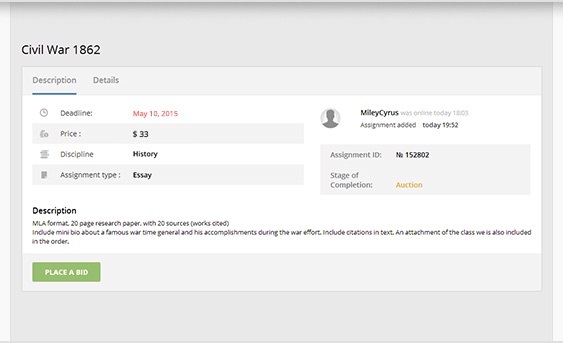 STEP 1 Create an Order Explain your assignment in details - this will help Writers to estimate its cost. Attach any necessary files that need to go with your Assignment. STEP 3 Choose a Writer Please wait until you have received a confirmation from the Writer that he is able to complete your assignment before the deadline. You will then get an email notification that the Writer is ready to begin. STEP 4 Payment After you have chosen a Writer, it will be necessary to make a payment. If you are not satisfied with the quality of the Writer's work on your assignment, we will refund your order. STEP 5 Communicate with your Writer In the process of creating your order, you can communicate with the Writer directly. 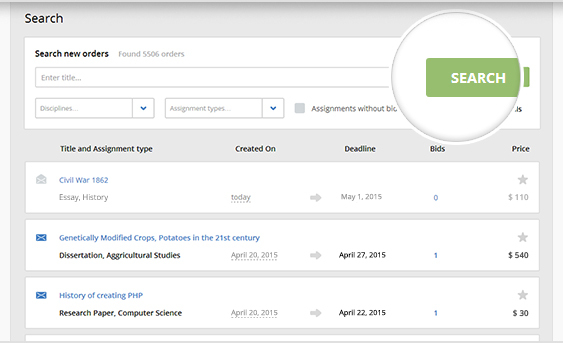 You can receive drafts of your assignment while it's being prepared. Warranty period has expired. During the 20 days Warranty Period you can request for corrections needed in the finished assignment for free. STEP 7 Rate Your Writer We will be grateful if you will make a review and rate the Writer you choose, once the assignment is completed. This will help other Students to choose the best Writer and save time. depending on your qualifications. For narrowing down your search - use the site's filter. This will help the Student be sure you are the most qualified for his Assignment. that you can fulfil the order before the deadline. You can then begin work right away. STEP 5 Communicate with the Student You communicate directly with the Student during the work process. You can clarify and make corrections right away! 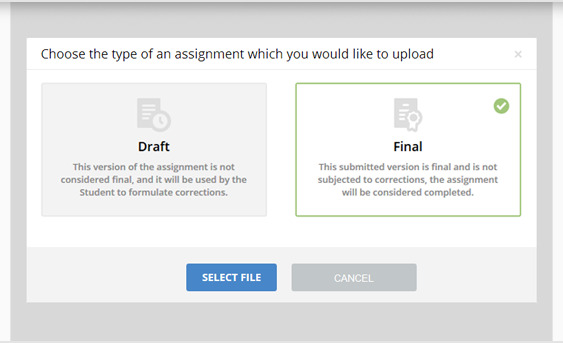 you will need to upload the final version of your Assignment to our system. you will get the payment deposited into your account. The Warranty Period may be cancelled by the Student, if the assignment is accepted/approved by the Student right away. 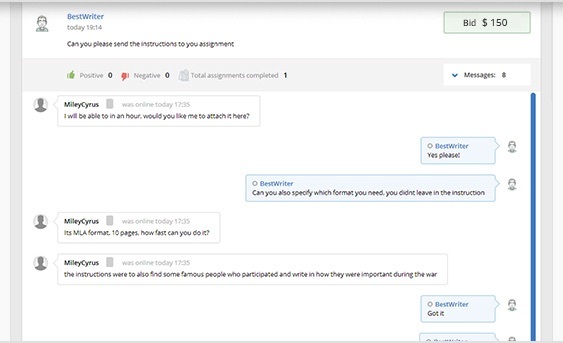 STEP 8 Reviews Students rate the quality of your work on their Assignments. Based on their ratings, you begin to grow in the system. The higher the rating, the more likely Students will choose you as their Writer. When filling out the application form, the Writer must indicate only true and reliable information (name, date of birth, contact details, education level, etc.). If the information is incorrect or untrue, the profile will be blocked. It is strictly prohibited to transfer (give away or sell) personal accounts to third parties as well as to buy Studybay accounts. The original account creator is solely responsible for any violations or illegal actions happened on their account and will face all the consequences of such actions. Communication between Writers and Customers may only happen via StudyBay. It is strictly forbidden to exchange contact information (e-mail address, Skype IDs, phone numbers, Facebook or any other social media profiles, etc.) for communication outside of the platform. If the administration detects any attempts to share contact information or acceptance of someone else’s contact information, the accounts involved will be banned. While completing an order, a Writer must comply with the deadline and provide the assignment in accordance with the Customer’s instructions. Customers and Writers are able to chat on the platform throughout the whole process of completing the order and for one month after the order has been finished. If a Writer repeatedly violates any rules, ignores orders instructions, violates deadlines, refuses to make necessary corrections within the allotted time, provides plagiarized or poorly written papers, or shows inappropriate, unprofessional, and aggressive behavior toward the Customer and/or the Administration, the Administration has a right to temporarily or permanently ban the Writer’s account or restrict it from taking new orders. Withdrawal applications are processed by the Accounting department manually on weekdays during their working hours. It usually takes 3 business days for the Accounting department to do it. After your withdrawal is processed, it might still take some time for the money to hit your account, that usually depends on your payment system or your bank. Once the payment for an order is transferred to the Writer, the copyright for the work is transferred to the Customer. This means that the Writer cannot claim authorship of the completed assignment, share it with anyone, or publish it anywhere. Only in case of a full refund the Writer keeps the copyright. 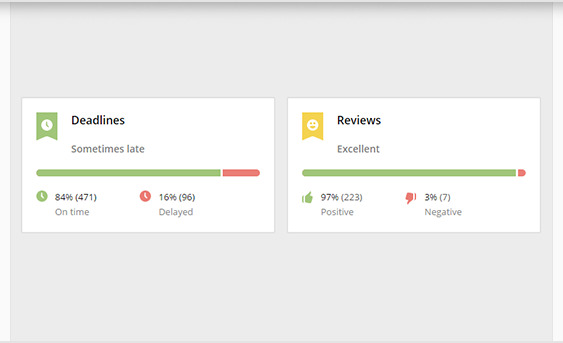 If the Customer requests a refund for the work due to its inappropriate quality and the situation cannot be resolved by mutual agreement with the Writer, the Studybay administration reviews the case and makes a decision (it can take up to 5 working days). The Writer does not upload the final version of the assignment before the deadline. The topic of the paper is completely different from the one requested by the Customer. The quality of the paper is extremely poor (too many grammar, punctual, structure and logic mistakes), the paper is not revisable. The instructions for the assignment is ignored to a major extent. A partial refund (up to 90%) is given to the Customer if the Writer uploads the assignment but refuses to provide requested corrections (the Student must explain, what percentage of work has not been completed by the Writer) or if the paper is of satisfactory quality containing some minor errors even after corrections. 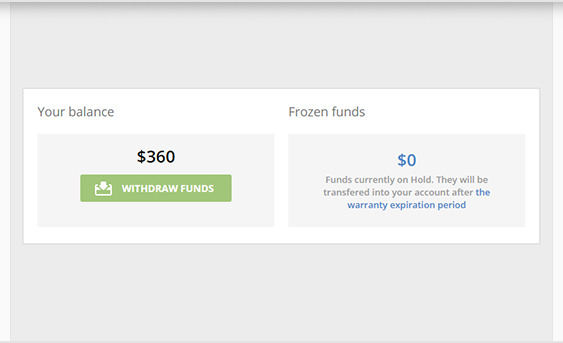 In case a refund request is approved, the money is returned to the Customer’s Studybay account immediately. This money can be used to pay for other orders. If the Customer wants to get the money back to their bank card or Paypal account, they should withdraw it themselves (this option is available on the Balance page). The Administration has a right to decline a Customer’s request for a refund if he or she has not requested any corrections before demanding a refund. If the Writer is consistently online and is ready to make corrections, the Customer must send the work for a revision at least once. 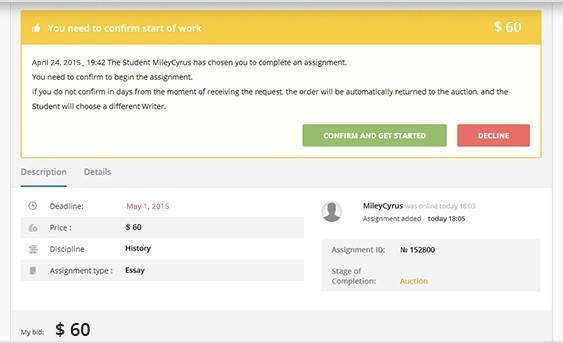 The Writer must confirm working on the assignment within a specific time period (12 hours), or the assignment will be returned to the auction. In this case the Writer's rating may be reduced. The Customer also has an option to decline the selected writer and hire another one if the originally selected writer does not confirm the order within 3 hours. 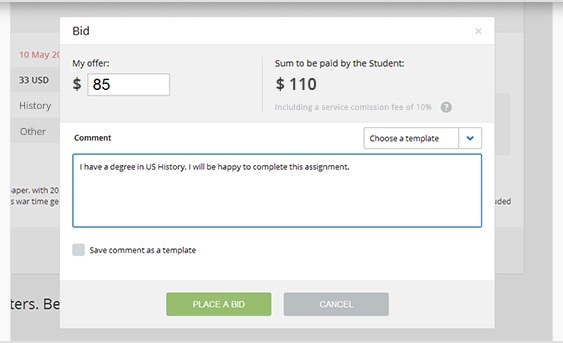 Users may only pay for the assignments using the options provided by http://studybay.com. It is forbidden to transfer payments outside the site (online wallets, bank cards, mobile phones, etc.) directly to the Writer. By working on StudyBay, you hereby confirm that you are familiar with the rules of the Service.